COLUMBUS, Ohio - With weather befitting a Patriots game in December more than a baseball game on Patriots' Day, the Pawtucket Red Sox belted three home runs and dispatched the Columbus Clippers, 9-6, amid snowfall Monday night at Huntington Park. The PawSox (4-5) scored multiple runs in four different innings and blasted out of an early 4-0 hole to claim the opener of the three-game series with the Clippers (4-6). 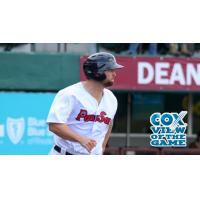 Designated hitter Mike Olt, shortstop Mike Miller and first baseman Sam Travis each hit their first home runs of the season as part of an outpouring of six extra-base hits for the Pawtucket offense. Four PawSox pitchers, meanwhile, combined to stack up 15 strikeouts, the second-most so far this season. Olt, who had tallied just two hits but worked seven walks in his first four games after being promoted from Double-A Portland last week, went 4-for-4 with his big fly and three consecutive doubles in his next three trips to the plate. Olt's four extra-base hits were the most for a Pawtucket player in a game since Andy LaRoche also had four (three doubles and a home run) on June 30, 2012 against Lehigh Valley. Travis, for his part, went 2-for-5 with two RBIs to post his third consecutive multi-hit game. Pawtucket starter William Cuevas allowed five runs on three hits and three walks in four innings - two of which were played in heavy snowfall. With the bases loaded and one run already home in the third inning, Cuevas responded with a pair of clutch strikeouts to limit the damage and set the stage for a Pawtucket rally in the middle innings. Right-hander Kyle Martin (W, 1-1)- notably pitching with short sleeves in the frigid temperatures - followed with a pair of hitless innings with three strikeouts before lefty Robby Scott struck out the side in the seventh. Ryan Brasier (S, 1) finalized a six-out save despite giving up three hits and a walk. Columbus starter Alexi Ogando, who tied for the Red Sox team lead with 64 appearances out of the Boston bullpen in 2015, gave up five runs (three earned) in 4.1 frames with four strikeouts and no walks. Clippers reliever Jack Leathersich (L, 0-2) allowed the go-ahead home run in the fifth inning. In a bottom of the first inning highlighted by some sideways snowfall, Columbus snatched a 4-0 lead on a two-run home run to right field from catching prospect Francisco Mejia and an inside-the-park homer to left-center from second baseman Adam Rosales. The PawSox sliced the deficit in half in the top of the second when Olt smacked his first home run since his promotion - a two-run shot to left field. With the snow again blowing in the bottom of the third, a Pawtucket defensive misplay and a wild pitch helped load the bases for Columbus, who then worked a bases-loaded walk to stretch the lead to 5-2. In the fourth, Olt ripped an RBI double down the left-field line to score left fielder Jeremy Barfield, who had reached on an error. With one out, catcher Dan Butler then bounced a grounder to short that scored second baseman Ivan De Jesus Jr. from third, making it a one-run game at 5-4. Miller led off the top of the fifth inning by teeing off on a solo home run to left field to tie the game, 5-5. Three batters later, Travis skied his first home run of the season to the batter's eye to hand Pawtucket its first lead, 6-5. In the sixth, Miller skied a fly ball to left field where, with the wind blowing and a few stray snowflakes falling, Columbus left fielder Richie Shaffer dropped the ball and allowed a run to score to push the PawSox up 7-5. Travis poked an RBI single to right field in the seventh inning to plate right fielder Aneury Tavarez and make it 8-5. Three batters later, Olt delivered his third double off the wall in center to score Barfield all the way from first. Columbus cut it to 9-6 in the seventh when it scored an unearned run on an RBI single to center from Mejia. The three-game series with Columbus continues Tuesday at Huntington Park at 6:35 p.m. PawSox right-hander Chandler Shepherd (0-0, 9.00 ERA) is scheduled to oppose Clippers lefty Shawn Morimando (1-1, 8.18). Radio coverage on WHJJ (920 AM and 104.7 FM) and throughout the PawSox Radio Network begins with the pre-game show at 6:05 p.m. Following that three-game series in Columbus, the PawSox return home for a seven-game homestand April 20-25 (Friday-Wednesday) against the Gwinnett Stripers and Toledo. Good seats are available, and fans can visit the McCoy Stadium box office, which is open Monday-Friday from 10 a.m. through 5 p.m., and during all home games. Fans can also call (401) 724-7300 or log on to PawSox.com for tickets.